Forest and Landscape College in Nødebo where hosts to the First International QGIS conference and developer meeting in September 2015. 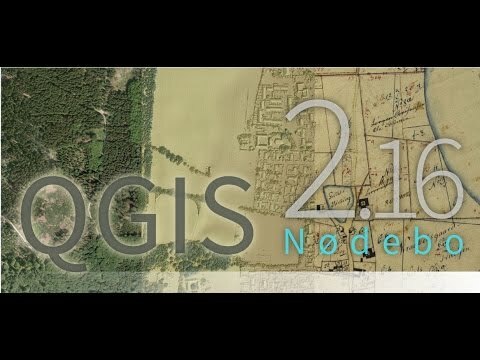 If you are upgrading from QGIS 2.14 you will find a great many new features in this release. We encourage you to peruse the changelogs for previous releases releases as this QGIS 2.16 release includes all features published in those releases too. The authentication system features introduced in earlier versions of QGIS (2.12 and 2.14) are now fully documented in the Users manual, and will be a great contribute to the system's understanding and adoption. current stable release (2.16) of QGIS. Today's date is now highlighted in calendar popup widgets, making it easier to select a date relative to the current day. This change brings the canvas behaviour into line with other design apps and also with the composer behaviour. The "arrow" symbol layer is a symbol layer allowing to draw straight or curved arrows from a line layer. In curved mode, nodes of the line layer this symbol layer is applied to are used as control points for circle arcs. Arrows can be filled with whatever existing filling style QGIS supports. Options also allows to select the type of the arrow (with one or two heads, plain or halved), its width (that may be variable) and size of the heads. A "filled marker" is similar to the simple marker symbol layer, except that it uses a fill sub symbol to render the marker. This allows use of all the existing QGIS fill (and outline) styles for rendering markers, eg gradient or shapeburst fills. Additional accessibility and low visions symbols are now available in QGIS' SVG symbols collection. Using the new "No symbol" renderer in QGIS 2.16 no symbol will be drawn for features, but labeling, diagrams and other non-symbol parts will still be shown. This is intended as a handy shortcut for layers which you only want to show labels or diagrams for, and avoids the need to render symbols with totally transparent fill/border to achieve this. It may not sound useful from the title - but it's quite a handy shortcut! Allows for setting a point's offset if it is bound to a field using data defined overrides. The offset field should be a text field. The map tool to interactively set the offset is in the advanced digitising toolbar in the icon group with the point rotation tool. See the attached animation for an example. Note that when making subsequent adjustments to the offset, you should drag from the original point vertex marker, not the current position of the symbol as rendered on the map. The style dock is a new, far more efficient, way to manage layer styles in QGIS. It supports a live preview of style changes as they are made, full undo / redo support and a less distracted workflow as you prepare your map cartography. For a comprehensive overview of the style dock's features, please see style dock part 1 and style dock part 2. In previous versions of QGIS when rule-based labelling was in place, you could not use the labelling map tools to interactively place and rotate label positions. This is now supported. A new "legend" tab has been added to diagram properties, allowing both the existing attribute legend and a new size legend to be enabled/disabled. The size legend has a configurable marker symbol. - highlight the pinned labels. Highlighting is green on editable layer, blue otherwise. The user can select the algorithm to use when the local-side simplification runs to draw geometries faster. This change also moves the local "on-the-fly" simplification from the provider and iterator classes to the rendering code. This avoids cases where simplification changes the geometry fetched from vector data providers, possibly affecting rule based and other expression based symbology. This is important when you have expressions that use the feature geometry (e.g. calculation of area) - we want to be sure that these calculations are done on the original geometry, not on the simplified ones. When enabled, repeating locks are not automatically cleared when a new point is added. They are handy when the same constraint must be repeated for multiple points (eg adding vertices which are always 50 meters apart). This functionality is available in the Advanced Digitising Panel. The reshape tool now allows you to extend linestrings, by starting a reshape at either a line's start or end point. Checkboxes have been added so that you can select which attributes you want included in the export, and you also now have the option to write "displayed" values rather than raw values. This option is useful for layers with relations, where you'd like a literal value included rather than a numeric identifier. Depending on the data format, the "displayed value" is enabled by default, e.g. for export to spreadsheet formats (ODF, XLSX, CSV/Text). The relation reference widget was enhanced to allow quicker extensions of related value lists. If the checkbox "Allow adding new features" is enabled in the widget properties (access through "Fields" tab in layer properties), a green plus button will appear to the right of the widget. After pressing the "Plus" button, the dialog of the related table will open in "new record" mode where one can add an additional entry. It is now possible to put widgets directly on the form with the drag and drop designer. A drag and drop designer form can therefore exist without any tabs on it. In QGIS 2.16 a new mode was added to the attribute table dialog for searching and filtering features. When activated (using a button on the toolbar or by pressng CTRL+F), the dialog will switch to form view and all widgets are replaced with their search widget wrapper variant. Alongside each widget is a tool button with options for controlling the search/filter behaviour for that field, eg "equal to", "not equal to", "is null", "greater than", etc.., with the options presented matching themselves to the corresponding field and widget type. You can also access this mode with the new "Select by Value" option, or by pressing F3 with a layer selected. The GeoPackage format is an open standard for geospatial data that should be on your radar as a replacement for the ESRI Shapefile format. It addresses many shortcomings with the shape file format including limitations in the number and width of fields. In QGIS 2.16 it is now easy to create a new GeoPackage as it has been integrated into the Layer toolbar and Layer -> Create Layermenu. In previous QGIS versions there was no way to check the validity of values entered by a user for a feature's attributes. Now, a user can specify a constraint on each widget in an layer's attribute form. Constraints are created using QGIS' expressions, eg "min_population" > 50000. A "Not Null" checkbox is also available to indicate that a value must be entered for the field. Additionally, descriptive text can be added to give the user helpful feedback when a constraint fails. Constraints are evaluated on the fly while a user is modifying a feature. A tooltip is available on any field having a constraint, showing the constraint's expression, the result of the evaluation and a description of the constraint. A message bar will also displayed at the top of the form summarizing any fields which do not meet the constraint criteria. This change allows the attributes of multiple features to be edited simultaneously. It is enabled when the attribute table dialog is in "form mode", via a new "multi edit" button on the toolbar. There's also a shortcut to edit multiple selected features by using Edit -> Modify Attributes of Selected Features. Now labels and HTML boxes can contain relative URLs. If we don't have a base URL, the project file will be used as a base URL. This change makes the current atlas feature (and additionally all attributes of related child features) available to the source of a composer HTML item, allowing the item to dynamically adjust its rendered HTML in response to the feature's properties. An example use case is dynamically populating a HTML table with all the attributes of related child features for the atlas feature. In QGIS 2.16, the base stylesheet of composer labels will automatically set the label font and margins to match the label's settings. This allows interactive choice of font, margins and colors and avoids the need to manually set these with CSS within the label HTML code. In QGIS 2.16 the map composer automatically georeference outputs (when the output format makes this possible, eg TIF and PDF). separate world file if that option is checked. A new option has been added in composer map properties: "Follow visibility preset" with a combo box to choose the active preset. This is an alternative to "lock layers" (and "lock layer styles") functionality which just copy a preset's configuration, while this new option creates a link to the preset. The difference is that when a preset is updated, composer map will automatically pick the new configuration when following the preset, while there is no update if "lock layers" (and "lock layer styles") option is used. fTools is a core plugin that for many years has provided the tools found in the Vectormenu in QGIS. With the advent of the QGIS processing framework, the fTools began to represent a duplication of effort, and many of the tools have been improved in their Processing equivalents. To address, the fTools plugin has been removed from QGIS and equivalent menu entries have been added to the vector menu, pointing to the Processing framework tools that achieve the same thing. In case and authentication method has been set on PostGIS connection, user will be asked for his master password. Note that, for the moment, GRASS7 Processing algorithms can only use and produce Shapefile vector layers and GeoTiff rasters. There is also a limit for some GRASS7 raster algorithms (all of the algorithms that are manipulating color tables) which duplicate raster layers to temporary directories. Depending on the size of your source rasters, you will probably need some disk space to handle them. This feature is quite convenient for users who would like to switch from an ESRI GIS stack without losing anything they already have built on private or public map services. You can also connect to public services provided by ESRI. Feature: Generation of default values on Postgres layers "just in time"
postgres database are currently being printed on the feature form. opening the form and will directly print the new value in the feature form. Because sometimes it's just nice to exaggerate about the size. I also forward ported a bunch of fixes from Sourcepole's fork. Here are the tickets I've dealt with during my allocated time for QGIS 2.16 bug fixing.